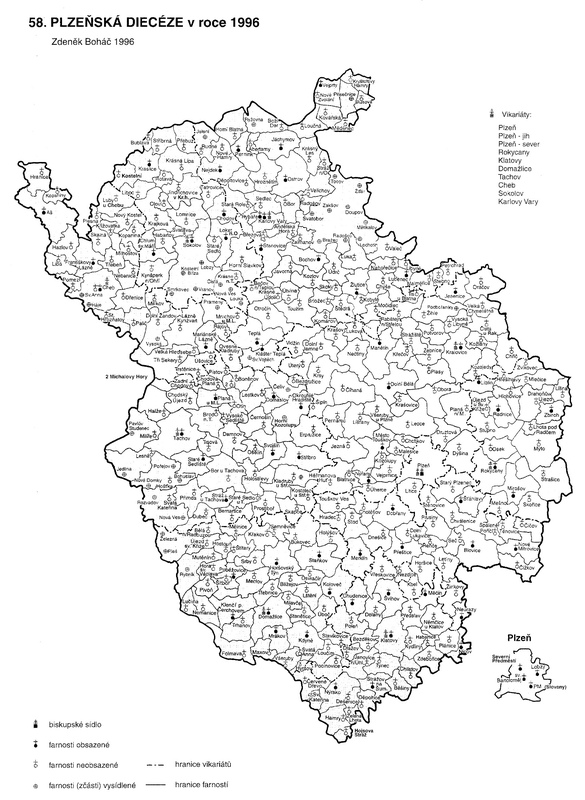 Districts: Domažlice, Cheb, Karlovy Vary, Klatovy, Plzeň-jih, Plzeň-město, Plzeň-sever, Rokycany, Sokolov a Tachov. The Pilsen online volumes of birth, marriage, and death records, similar to other archives are arranged by parish. Once you enter the name of the village you want to search, a listing all the books for that village name. When you click on the link you will find a feature unique to this archive by scrolling below the page images. Unlike the other archives where you typically have to page through the images to find the specific village records or the page where one type of record stops and the next begins, the information at the bottom of this page will tell you the order in which the records are organized in this volume and often how many pages there are for each section. It’s a huge time savor! Also note that if there are more than one villages with the same name in this district, the search will bring up the records for all parishes. Using the information about the parish maps below may help you determine the correct parish. One limitation in this archive is that there are times in the earlier records where you will need to search surrounding parishes to find where the records were stored before the more recent parish was created. There is no easy way to find these records other than to search surrounding parishes. Again, use the information below to help you locate the potential earlier parishes. In addition to the birth, marriage and death records, the website also has information on residence applications, chronicles of municipalities of Pilsen, school chronicles and maps. It also contains some census records, periodicles, and even the lists of spa guests at various locations. Cadastral Maps: Cadastral Maps are not available through the Plzen website. Click here for basic information about accessing cadastral maps. Other Records: The onsite holdings include collections on a wide range of topics such as documentation of the liberation by the US Army, slides, music, patents, and seals and stamps just to name a few. Visit the website for more information. The district archives are also available to find other types of information such as census records, letters requesting permission to emigrate, certain land records, marriage contracts with register of brides dowry, school records, political records, town chronicles (history), and court proceedings. Some materials are online, but most of the records held by these sites require an onsite visit or can be searched through a professional researcher. Many records from this archive can also be found in FamilySearch. Additional information about using the Plzen Archive can be found at FamilySearch Wiki.